Today I wore Ben’s Lou Gehrig Yankees jersey to school. When Ben was diagnosed with the disease, he asked for it. He barely got to wear it, but I have adopted it and I feel proud and especially connected to Ben when I wear it. I usually wear it once during the school year, during ALS Awareness month. Last year I chose not to wear it to school because I was still very emotional (it had not yet been even a year) and I was concerned that if the kids asked me about it, I would cry. This year, I might still cry, but I am better about talking with the kids about Ben, and most know that I have a husband who died. A couple of years ago, a student asked me why I wore this particular jersey. I said that my husband had the same disease Gehrig had. He asked about it and I asked if he ever heard of the Ice Bucket Challenge. He did, but he did not make the connection to a disease. I told him the Challenge was to raise money to find a cure for ALS/Lou Gehrig’s disease, and, trying to make sense of it, he asked if it was a disease where people were cold all the time. It made me smile then and it still does. If only it were that simple! They are young, they do not need a lot of details. Some will ask many questions, some will Google it, and they will learn. And, that’s a good thing. I’m proud to have the opportunity to raise awareness of ALS, though I surely wish that Ben had not had it. Our experience with ALS truly is never out of my mind. The students that I had while my dad and Ben were alive and ill learned about compassion when they saw me run out of school in tears in a panic because of an emergency, or listened to me explain on rare occasions that although I never use my cell phone in class, I was awaiting an important call from a doctor. And, when my phone rang, they were silent and I know that many felt my worry. Some were sympathetic and compassionate. Those are life skills you cannot gain from a text book. They are important. Some kids do not learn this at home. Ben’s Lou Gehrig Yankees jersey is one way that I proudly raise awareness of ALS and all it encompasses. 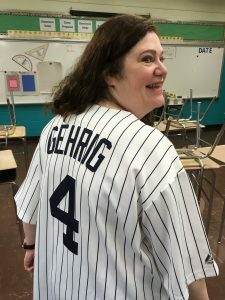 While I love to see the students’ glee from seeing the klutziest, Disney-est teacher in school wearing a sports jersey, I know that they are also learning about a man named Lou Gehrig who had a terrible disease that my husband had, too. They see how their teacher has a “real” life in which she cared for and lost her loved ones, experiences grief and continues to live and love and care for her students on our good and bad days. Life lessons.